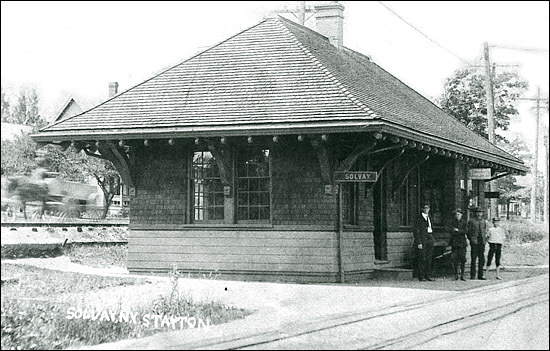 This was Solvay's train station, located, of course, on Milton Avenue. The station would have been on the north side of Milton; the terrain on the left suggests a location between Orchard and Woods roads. If anyone knows for sure, please contact me at the email address at the bottom of the page. Looking east on Milton Avenue in what we used to call West Solvay (back in the 1940s and '50s we divided the village in two, like post-World War II Berlin; East Solvay kids went to Prospect Elementary School, West Solvay kids went to Boyd Elementary School). Anyway, this photo dates from 1908; the building on the right housed Sherwood's Pharmacy, which means the intersecting street is Cogswell Avenue. As for the buildings east of Cogswell ... well, check the caption on the photo below. This is one of my favorite photos of old Solvay. The date is unknown, but it looks like these men could be spectators at the battle of the OK Corral. 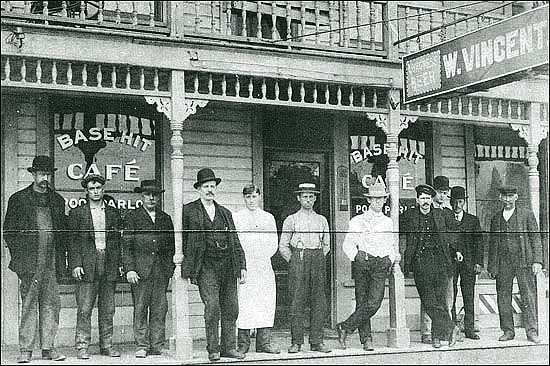 The words on the windows indicate this was the Base Hit Cafe, which was owned by William Vincent, at 1031 Milton Avenue, which I believe was in the second building east of Cogwell Avenue in the photo above. According to the 1913 Syracuse area directory, there were nine saloons on the 1000 block of Milton Avenue, including three in the building on the corner, across the street from the Sherwood Pharmacy. There were three more saloons in the 900 block, plus nine more in East Solvay, close to the main entrance of the Solvay Process Company at the Lamont Avenue intersection. Seven more saloons were located on other streets, just off Milton Avenue. 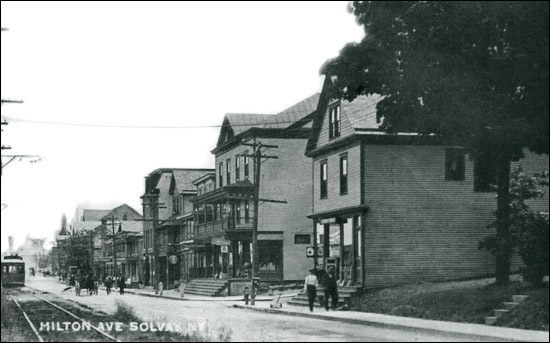 The total of 28 saloons provided the basis for a belief that the village of Solvay had more bars per capita than any other place in the country. How many of them survived Prohibition I do not know. 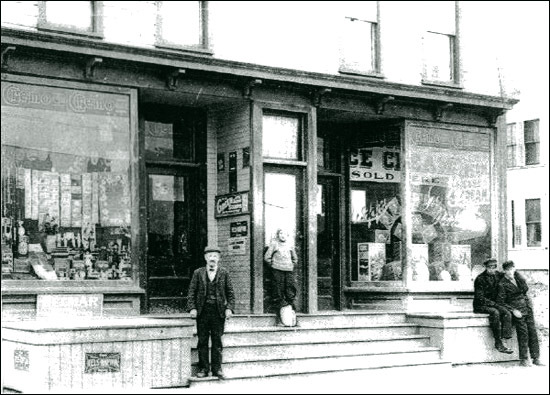 This photo appears on the website of the Solvay-Geddes Historical Society and is identified as Peter Lapp's confectionary store (notice the big sign in the window: ICE CREAM sold here). According to the 1913 Syracuse area directory, Lapp's was located at 1301 Milton Avenue, a couple of blocks west of the Sherwood Pharmacy and away from the cluster of saloons. This later became Keefe's Drug Store. Who took this photo I do not know, but it appeared in "The History of Solvay," produced in 1940 by the Social Science Department of the Solvay Schools.